It's been very slow lately, and I don't have many requests out so it may stay slow for a while. 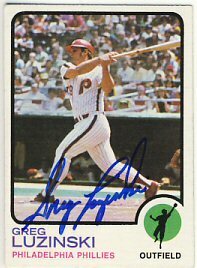 Today I received a return from Greg Luzinski, who signed his 1971, 1972 and 1973 Topps for me. 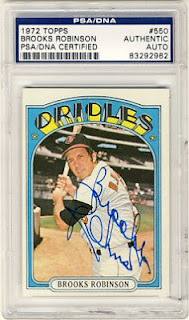 This makes 378 signed 1972 Topps in my set, just 22 short of my goal for the year. I was away for a few days and came home to find two through the mail returns in my mailbox. 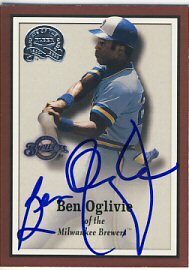 First, Ben Oglivie signed his 2000 Fleer Greats of the Game card for me. I really like this set have have quite a few, but haven't concentrated on it much for a while. I may try to get a few more of these but I'm not sure if I'll spend much money to get the big names. 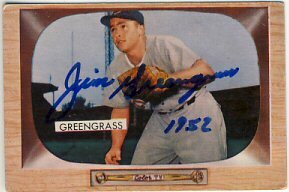 I also got a great return from Jim Greengrass. 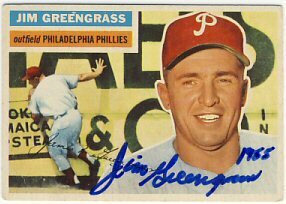 I sent him four cards, including a1953 Topps, 1954 Topps, 1954 Bowman and 1955 Bowman. 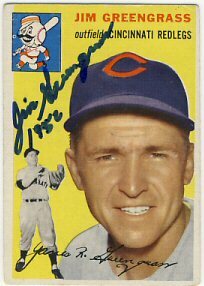 He signed them all and also returned a signed 1956 Topps as well as two custom index cards! 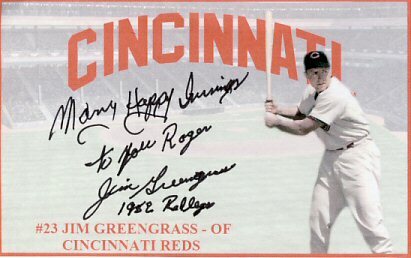 I'm not sure what the "1952" inscription he added to many of the cards refers to. I received an ebay purchase in the mail today. 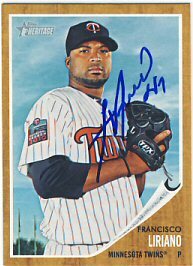 I knocked one more Francisco Liriano card off my wantlist by buying a 2011 Topps Heritage that he signed. Now I just need 2006, 2008 and 2011 Allen & Ginters to have all the autographs I need of him. Anybody have some to sell? I started a new blog last weekend that focuses on my comic collecting. It's called "My Comical Problem". If you're interested in comics, please give it a try. My older son also started a blog that focuses on his hunting and fishing here in Minnesota. He would appreciate any readers so please give it a try as well. It's called "Minnesota Woods and Lakes." 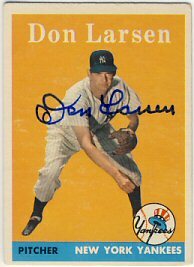 One nice return today: Don Larsen signed his 1956 and 1958 Topps in blue sharpie. 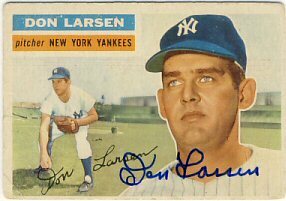 Mr. Larsen charges for his signature. 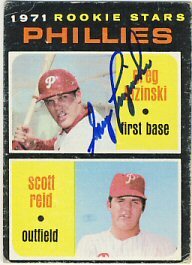 I paid $10 for these two cards to be signed. He offers the best bargain around as well. 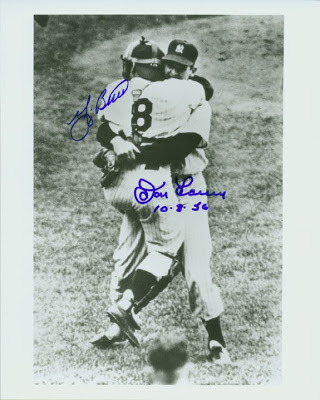 He sells a picture of him and Yogi Berra celebrating after Larsen's perfect game in the 1956 World Series, signed by both of them, for only $40. I purchased one years ago. 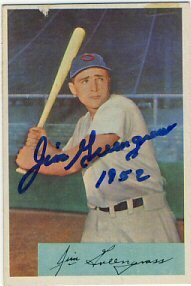 Berra charges at least $75 for an autograph these days, so this is a great deal. If you haven't bought one, what are you waiting for? I received two returns today. 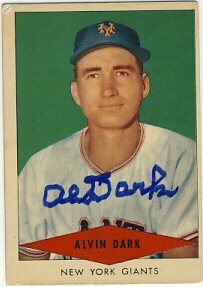 Al Dark signed his 1954 Red Heart (Dog Food) card. I enclosed $5 with my request. 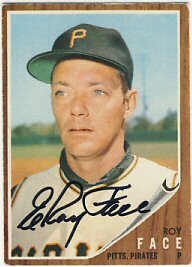 Roy Face signed a 1961 Topps Buc Hill Aces and his 1962 Topps. 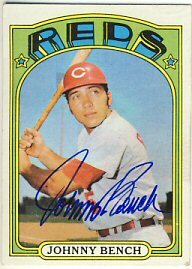 I bought a handful of 1972 Topps to send out which I hope to get done tomorrow. Today I received some purchases as well as some cards back from a mail-in signing. First, I received a 1972 Topps signed by Brooks Robinson and authenticated by PSA/DNA that I bought on Ebay. 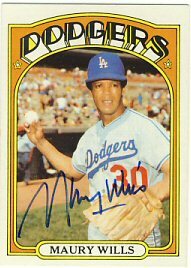 I also received a 1972 Topps and 1972 Topps In Action signed by Maury Wills that I bought from a fellow member on sportscollectors.net. 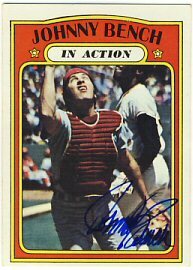 Finally, I received three cards signed by Johnny Bench that I sent in to an AtommicSports signing, including a 1972 Topps, 1972 Topps In Action and 2008 Goudey. 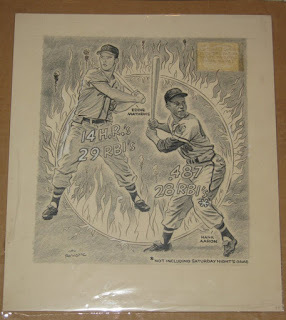 A couple weeks ago I posted about a Charlie Dressen drawing by Al Rainovic that I bought on Ebay. 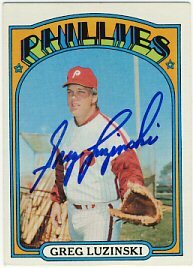 That Ebay seller also had another one for sale, but I passed on it because the starting price was too high, although I thought someone else wold probably buy it. Nobody bought it, and the seller relisted it at a lower price, so I bought it. 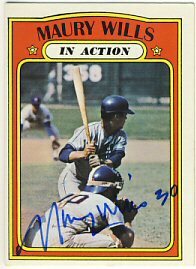 This one features Hank Aaron and Eddie Mathews. 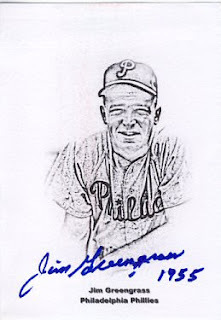 The drawing itself is about 11.25 inches tall and 10 inches wide. 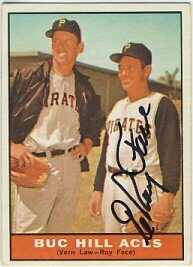 The text in the upper right corner is hard to read, but says, "Lo, the poor National League pitchers facing these two guys these days!" 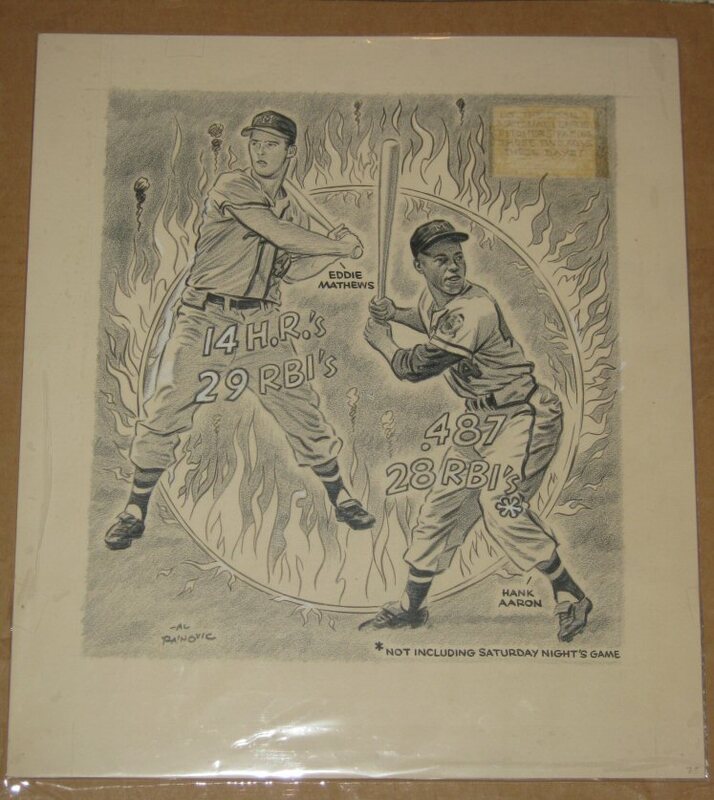 I'm trying to figure out approximately what date this may have appeared and find the this one printed in the Milwaukee Journal archives on Google. 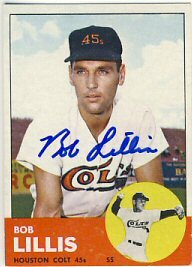 Today I received a recent Ebay purchase. 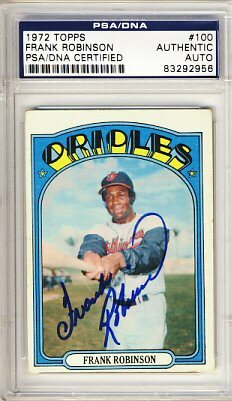 I bought a 1972 Topps signed by Frank Robinson and authenticated by PSA/DNA. 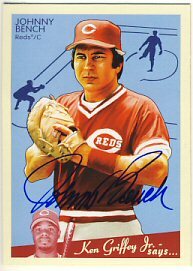 I was able to buy this for less than the normal price of his autograph at a show. I received one nice return today. 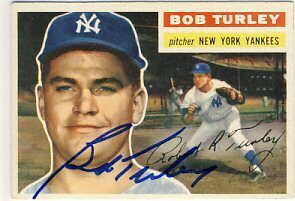 Bob Turley signed his 1956 Topps. 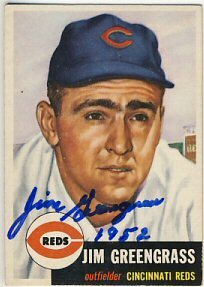 I have just a handful of requests out so it will continue to be a little slow for a while. I received one return yesterday. 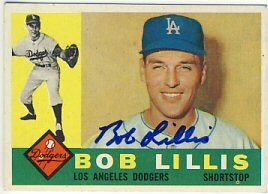 Bob Lillis signed his 1960 and 1963 Topps that I sent to him last April.